Delkin has something different on offer in the field of universal chargers. Unlike the others, the Delkin Devices unit doesn’t adjust to fit a battery. Instead, it uses battery-specific plates that insert into the charging dock. Our review sample is a Nikon Bundle that includes six plates to fit the most popular Nikon batteries. This can be expanded upon with different plates for Canon, Olympus, Casio, Panasonic, Sony and Fujifilm. A charge percentage is indicated by an LED to the left of the battery that shows the charge at 25%, 50%, 75% and 100%. Uniquely, the Delkin can charge two camera batteries at the same time. It also features an in-car 12V DC adapter. 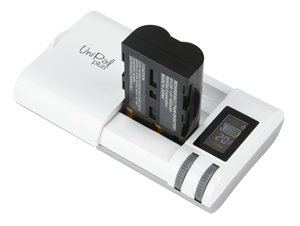 The Hähnel UniPal Plus Universal Charger looks very stylish and is claimed to charge nearly all lithium-ion batteries from various digital cameras. It can also charge two Ni-MH AA/AAA batteries at a time. An LCD display on the right side shows the charging status, and a power percentage from the battery will be displayed even if the charging unit isn’t powered, which is perfect for testing batteries on the go. Two scroll wheels below the LCD control the position of the +/- connections. Of all the units, this was the easiest to position. A mains adapter with a small slide on/off plug for both EU and UK plugs and a 12V DC car adapter are included, as is a powered USB for charging mobiles, MP3 players and other devices. 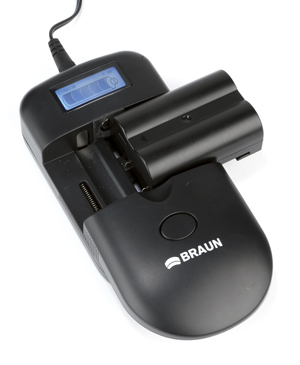 Updated from the original 1-For-All-Plus, the new Braun 1-For-All-Switch now features a USB port to power devices. It can also power a wealth of lithium-ion camera batteries. The 1-For-All-Switch is one of the simplest units on test and the easiest to use. It has two flat connectors. For pin-type connections, batteries need to be placed upright on the charger. 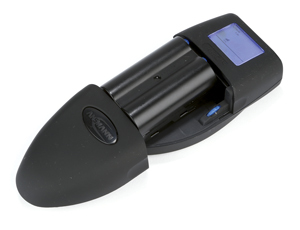 A blue LCD screen identifies the charge level, charging status, battery type and its voltage. The spring system holding the battery in place is sturdy, and overall the unit is well made and durable. Camcaddy claims to be able to charge 98% of camera batteries with the Camcaddy Camera Battery Charger. A helpful list has been created to check compatibility at www.solartechnology.co.uk/camcaddy. The best feature about the Camcaddy is that it can be powered via USB. This means it’s possible to charge from a laptop or other device, so it’s ideal for the photographer out and about. It comes with a mini USB-to-USB lead for powering the charger unit. A USB mains plug is also included in the kit, as are travel adapters for US, EU and in-car charging. Overall, the Camcaddy charger is a little fiddly but works well. The connections move only left and right – not up and down – although adapters are included for blade-style connections like those in many different Canon batteries. 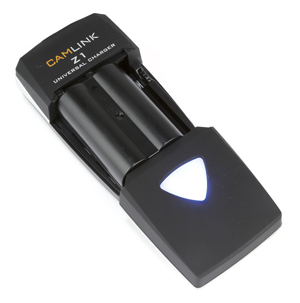 The CamLink Universal Charger is compatible with most 3.6-7.4V digital camera, camcorder and mobile-phone batteries. It is one of the smallest here, being only palm-sized, and will easily fit into even a small camera bag, which makes it great for travelling light. Like the Hähnel Charger, the CamLink Universal also features a slide on/off plug adapter for both EU and UK plugs and includes a 12V DC adapter for in-car charging. There are two connectors that can be moved left and right and a dial on the right side of the charger moves the connectors up and down. This allows perfect positioning with the +/- connections of the battery being charged. 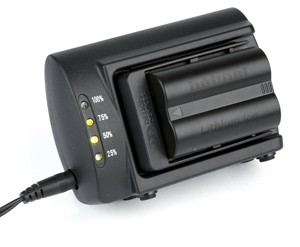 In addition to lithium-ion batteries, the unit can also charge two Ni-MH or NiCd AA/AAA batteries at a time. Overall, the Ansmann Digicarger Vario Pro is much like the CamLink. It’s similar in size but it has an LCD screen that displays the percentage of power held by the battery. Also, devices such as mobile phones can be charged via USB and it is possible to use a camera battery to power them. 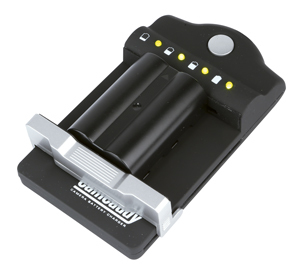 The Ansmann charger can charge two AA or AAA batteries at a time. The connectors have a pin and a blade, making the charger easy to connect and compatible with many different batteries. These connectors can be moved up and down through the use of an adjustment wheel on the right side of the battery area.